The English Reformation was part of the Protestant Reformation. This led to some Christian churches in Europe breaking away from Rome. Each of the countries that went through this process did so in a different way. Earlier the Roman Catholic Church had supreme powers. 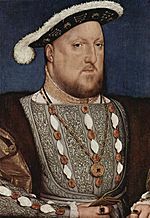 Henry VIII broke ties with the church and became head of the English church. This was called the Royal Supremacy. It was the beginning of the Church of England. For the first few years, the Church of England was almost exactly the same as the Catholic Church, except that it was ruled by the King instead of the Pope. There were several causes for the English Reformation. One of these was that Henry VIII, who was King of England, wanted to divorce his wife, Catherine of Aragon. Another reason was because Henry wanted to control the lands that belonged to the Church. The Church was rich. Henry thought that if he was in power of the church he would be richer (and gain power). The Protestant Reformation in Scotland, however, was based more on the teachings of Martin Luther, and so it had a rather different history. Thomas Cranmer (1489–1556), Henry VIII's Archbishop of Canterbury and editor and co-author of the first and second Books of Common Prayer. King Edward VI of England, in whose reign the reform of the Anglican Church moved in a more Protestant direction. Edward VI and the Pope: An Allegory of the Reformation. This Elizabethan work of propaganda depicts the handing over of power from Henry VIII, who lies dying in bed, to Edward VI, seated beneath a cloth of state with a slumping pope at his feet. In the top right of the picture is an image of men pulling down and smashing idols. At Edward's side are his uncle the Lord Protector Edward Seymour and members of the Privy Council. Queen Mary I of England restored the English allegiance to Rome. Queen Elizabeth I of England reached a moderate religious settlement. English Reformation Facts for Kids. Kiddle Encyclopedia.